We at BOOST LLC have reviewed the new DRFP for NASA FILMSS 2 and our pricing experts are providing the following insights on this solicitation. Continue reading for some challenges and pitfalls to avoid regarding this DRFP. The lack of incumbent task order history and incumbent staff pay/seniority on this $200+M NASA IDIQ unfairly tips the scale towards the incumbent contractor. NASA should be more transparent and disclose additional information to prospective offerors to foster better competition. NASA released the draft RFP on 12/21/2018. An Industry Day Conference was scheduled for Jan 9th and the final RFP release was scheduled for February 2019 with proposals due in March/April 2019. NASA has not yet released a revised schedule due to the partial Government shutdown. However, it’s likely the final RFP release won’t occur before March. This single-award contract, to be made based on best value, is divided into four parts consisting of a fixed price transition, a 60-month IDIQ CLIN, ‘Management Core’ and ‘Core Technical Elements’. The Management and Core Technical Element CLINs each have a 24-month base period and three 12-month option periods. All CLINs, except transition are Cost-Plus-Fixed-Fee (CPFF). The CLIN 4 IDIQ minimum is $5M with an ultimate IDIQ ceiling of $185M. NASA expects approximately 30‐40 IDIQ TOs with the base period and each option period. The place of performance remains the Ames Research Center, Moffett Field, CA. Offerors are required to complete Attachment Jb1 Cost and Price Template. The template contains 17 Exhibit tabs. The pricing requirements and associated exhibits are similar to the original FILMSS 1 solicitation which include pricing for the Transition, Management Core, and Core Technical Services. However, unlike the incumbent solicitation, the FILMSS 2 draft RFP does not request additional pricing of sample task orders. Instead, the RFP instructs offerors to price out a five-year total IDIQ of 938.8K labor hours across 39 specified labor categories. Below, we summarize key requirements of each element of cost. There are 68 unique labor categories across management, core technical, and IDIQ pricing exhibits which is somewhat more than the 54 total labor categories identified in the prior contract. However, only 37 standard labor category (SLC) descriptions are currently provided in attachment Jb7. The pricing template is pre-populated with labor hours for the Technical Core (532.4K labor hours vs. 586.6K from FILMSS 1) and the IDIQ portion (938.8K labor hours) of the contract. Offerors cannot change the pre-populated total labor hours or the distribution of hours among labor categories. However, they may allocate these hours among their team. Offerors must separately determine and price Key Personnel and Core Management level of effort. As with other NASA solicitations, offerors must identify the source of all proposed direct labor rates for all labor categories. However, at the time the draft RFP was released, NASA has not included a current Wage Determination (WD) for the contract. The prior WD was 2005-2061. Offerors must also submit a total compensation plan. For labor escalation, NASA provided suggested escalation rates on that range from 2.9% – 3.0%. NASA characterizes these rates as ‘recommendations’ and are not mandatory. The pricing template requests a single escalation rate by Contract Year and is applied to all labor categories regardless of exempt type. Offerors must provide 3 years’ worth of historical indirect pool and base costs that comprise their indirect rates and similar forecast details for each future Contractor Fiscal Years. NASA expects offerors to separately quantify G&A cost base totals Existing Business Base, the FILMSS 2 contract, and Other Forecasted Business Base to document any favorable rate impact from a large contract win. The RFP cautions offerors that they cannot use their provisional billings rates letter as a basis for forecast indirect rates. Offerors with a negotiated Forward Rate Price Agreement may submit the signed agreement in lieu of providing the indirect cost data in Exhibits 12 and 13. There are no requested direct or indirect ceiling rate ceilings requested in the draft solicitation. Pricing requirements are trivial. The RFP instructs offerors to propose $19.47M plug for ODCs and Travel (more than double the original plug from FILMSS 1 solicitation). The plugs are unburdened and offerors are free to apply burden consistent with their accounting systems and also to apply fee as offerors see fit. Pricing requirements for subcontractors depend on whether they are a major subcontractor ($8M over 5 years or $3M in any one year) or minor subcontractor (everything else). Major subcontractors must provide pricing details and associated cost volume narrative similar to the prime and can submit their proprietary data directly to NASA. Minor subcontractor pricing is summarized in a minor subcontractor pricing exhibit (Exhibit 14). The prime is expected to provide NASA with the prime’s cost and pricing reasonableness determinations for all subcontractors. Subcontractors that are proposed as either Cost Reimbursable, Time & Material, or non-competitive fixed price type contract in excess of $2M must also submit a total compensation plan. We think NASA needs to provide some additional information and pricing clarifications to offerors. First, provide some summary information on FILMSS 1 task order history. Second, provide basic incumbent pay rate and seniority metrics. Third, provide a current Wage Determination. Fourth, provide a reconciled list of all standard labor categories and fully populated labor categories description for all labor categories. Finally, NASA should refine the pricing template to ensure that offerors do not price in escalation for Service Contract Labor Standard covered labor categories. If you’re looking to BOOST your proposal give us a call or send us an email, [email protected] We’re able to provide pricing synopses on a variety of RFP opportunities to help you avoid pitfalls and tackle requirements the right way. Pricing Alert – The massive HHS/CMS PEO RFP is out! Are you prepared to tackle the complex pricing requirements? It might seem straight forward at first glance, but read our detailed Pricing Synopsis to look out for some challenges and pitfalls to avoid. Abstract: This 10 year $2B IDIQ contract has two task orders along with the IDIQ awards. However, bidders beware. Despite the use of fixed price task orders, there’s still a large amount of pricing detail and documentation required. Teams with large number of subcontractors will need dedicated management and support to ensure submission of accurate proposals. The Provider Enrollment and Oversight (PEO) Indefinite Delivery Indefinite Quantity (IDIQ) contract will provide contractor support to Centers for Medicare and Medicaid Services (CMS) to detect, prevent, and proactively deter fraud, waste and abuse in the Medicare and Medicaid programs. CMS anticipates multiple awards with a combined ceiling of $2B over the life of the contract. The ceiling may be increased at the CMS’s discretion. A minimum of 4 awards will be reserved for small businesses (under NAICS code 541990 and a size standard of $15M). The RFP (75FCMC18R0014) is silent on the number of potential awards to other than small businesses. The maximum ordering period is five years plus (1) additional five-year option period for a total ordering period of ten years. Neither the RFP or the IDIQ Ordering Guide clarify whether the task order period of performance can extend beyond the IDIQ ordering periods. In addition to the IDIQ contract awards, CMS will also award two Firm Fixed-Price Task Orders on an unrestricted (full and open) basis for Site Verification Services – Eastern Region and Western Region. The RFP notes that one Offeror cannot be awarded both Site Verification Services’ task orders. The proposal is organized into six volumes. Volumes I through IV pertain to the IDIQ proposal. Volumes V and VI are reserved for offerors bidding on the two awardable task orders which we discuss separately. The IDIQ pricing information content is divided between Volume I – Contract Documentation and Volume III Business Proposal. All offerors must submit basic pricing information which includes typical IDIQ level pricing requirements including accounting systems information, indirect rate information, and the submission of a sample task order pricing. The IDIQ award will be based on this information. 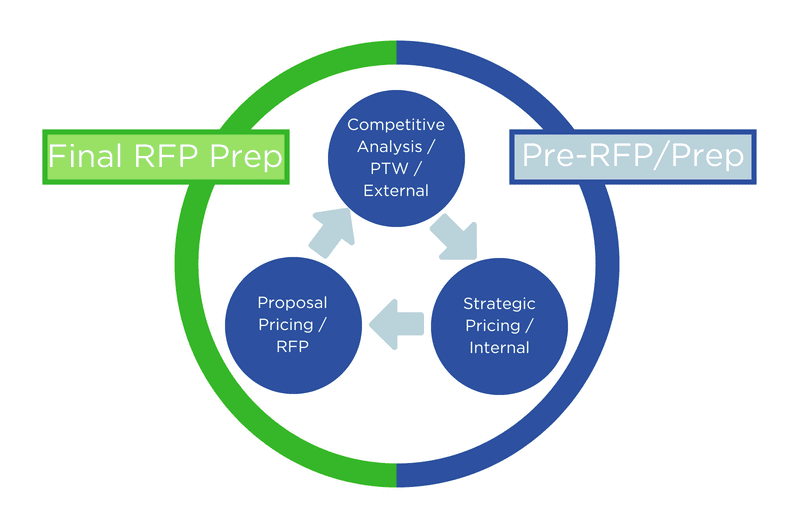 The RFP contemplates a predominant mixture of Cost Reimbursement (CR) and Firm-Fixed Price (FFP) form of task orders awarded. Offerors must have an accounting system that is deemed acceptable or adequate for determining costs Subcontractors who are anticipated to have CR contracting arrangements, including non-commercial Time and Materials type contracts, must also have an acceptable or adequate accounting system. Offerors must submit indirect rate information in Volume I including both approved provisional indirect rates and any forward rate price agreements. Offerors that have no prior history of approved indirect rates must submit support documentation for the prior 3 years consisting of their current year operating budget and a forecast covering the anticipated period of performance and associated documentation on that supports the proposed rates. The RFP does not request offerors to propose any IDIQ ceiling rates for either direct labor, indirect or fixed fee rate. However, the RFP contains a clause which gives CMS the option to establish ceiling indirect rates. We think clause this has implications for pricing the sample task order discussed below. The sample task order pricing is straightforward. Exhibit E.8 “QASP Sample Task Order Business Proposal Template” is to be priced for base and one option period. Labor is priced as fully burdened (inclusive of fee). The labor rates are then linked to a labor rate buildup backup detail for each task order period. Offerors must show the full detail of their proposed labor rate (including the erroneously termed ‘Fixed Fee’). Curiously, the pricing template requests offerors to map proposed travel and ODCs by SOW section. However, similar mapping information for labor costs is not required. Travel cost detail must be provided for the Kick-off meeting. However, for remaining travel, CMS requests offerors to use a plug unit cost of $2,000 per trip per person. For indirect rates, the instructions specifically state to cross-reference Volume I for indirect rate basis information. Finally, a compensation plan must accompany the sample task order pricing. CMS provided a streamlined template in Exhibit E.8 reflecting the minimum information necessary to comply with FAR 52.222-46. We recommend offerors take the hint and provide just the bare minimums necessary for compliance and nothing more. We’re not fans of RFPs that require pricing sample task orders that are not awarded. We believe they invite aggressive and potential unrealistic and irrational pricing. However, as mentioned above, there’s one RFP clause that could give bidders some pause from overly aggressive pricing of the sample task order, at least for indirect rates. Section E of Volume I instructions state, “In accordance with FAR 42.707, entitled ‘Cost Sharing Rates and Limitations on Indirect Cost Rates,’ CMS may establish indirect cost ceilings in the contract. If established, reimbursement will be limited to the negotiated indirect cost ceilings established in the contract…” We wonder what would happen if a bidder proposed aggressively low indirect rates for the sample task order (below their current approved provisional rates) and were awarded an IDIQ contract. Could CMS accept these low sample task order indirect rates and subsequently cap those rates for the life of the IDIQ? (Don’t say it can’t happen just because CMS did not make good on the threat on other contracts. I recall an Army recompete where, based on the prior contract, bidders priced the IDIQ using T&M rates with the understanding the Army would ultimately request task order pricing using those T&M rates, but issue task orders on a fixed price basis. Many bidders proposed low labor rates, assuming they could subsequently manage the labor hours on a fixed price task order to ensure adequate profit. The Army subsequently issued T&M type task orders, not fixed price, and the contract holders were stuck pricing and executing their task orders using the artificially low IDIQ T&M rates. The moral of the story: Anything is possible. Don’t assume past agency behavior is an assured prediction of future behavior). The IDIQ award will be based on the sample task order. CMS included two additional Firm Fixed Price (FFP) Task Order RFPs that will be awarded: Eastern Region Site Verification Services and Western Region Site Verification services. Both are full and open competitions. Offerors are permitted to bid on either one or both. However, CMS will not award both task orders to the same offeror. The cost proposals are contained within Volume VI (VI-A Eastern region, VI-B Western Region). Pricing for both task orders are organized similarly in Attachment J.5.C (Eastern Region) and Attachment J.6.C (Western Region). Each pricing template contains five CLINs representing separate 12-month periods of performance. Each CLIN contains an “AA” sub-CLIN for ‘Site Visits’ (sites not associated with an Independent Diagnostic Test Facility (IDTF)) and sub-CLIN“AB” for IDTF Site Visits. Each subCLIN is further divided into 4 visit types (48 hrs., 7 days, 15 days, or 30 days). While the pricing attachments appear to denote these site visits in terms of visit length, we note that each SOW denotes the 4 visit types in terms of response time. So, a “30-day site visit” as labeled in the pricing attachment appears to really mean perform the site visit within 30 days’ notice according the SOW. A 48-hour site visit would mean perform the visit within 48-hour notice. This is an important distinction and we recommend offerors confirm that the SOW’s definition of site visits types is the correct definition. Offerors must propose unit prices per visit type with associated breakdowns of fully burdened labor, travel. ODCs, and subcontract costs. The pricing templates are designed to apply the same proposed CLIN/Site-visit type unit price to both the minimum order guarantee quantities and to the (larger) estimated quantities. Therefore, the template produces two total prices: A ‘minimum quantity’ price and a total price based on ‘Estimated Quantity’. In addition to providing the Excel pricing attachments, offerors must provide a Business Proposal Narrative. The narrative must include among other things, a Basis of Estimate. The BOEs must, “describe the BOE used to establish those estimates as fair and reasonable. This includes providing all assumptions used to establish proposed prices and any and all empirical data which can provide further support to the proposed prices as fair and reasonable. The Government needs to understand how you determined the prices per element and how that correlates with the technical approach”. We’re surprised this level of detailed documentation is needed given the work scope is somewhat standardized and offerors are proposing fixed prices. We wonder why CMS wouldn’t rely on direct comparison of offeror prices to establish price reasonableness. Regrettably, this represents a lost opportunity to streamline the time and effort required for both the bidders and for CMS. The BOE instructions request further details for each cost element. Offerors must provide the labor category(s) that make up the “Labor” price per site visit and include information on proposed escalation of each price element as well as the level of ‘productive labor’ in 1 full time equivalent (FTE). Similar types of information are requested to explain travel and ODC costs. For subcontractor costs, the RFP does not explicitly request similar pricing details as the prime, except it specifically states primes must include a subcontract “Certificate of Current Cost or Pricing Data; as appropriate”. Until the Contracting Officer determines adequate competition does not exist, we do not believe there’s any reason for subcontractors to submit certified cost and pricing data. While each SOW (Eastern and Western) identifies the states and territories covered, each SOW also contains an extra provision to optionally expand the geographical scope of services required. SOW 3.3, paragraph 2 states, “The Contractor shall have the ability to conduct nationwide site verification services at locations in all 50 States and 6 Territories, if required by CMS and with a minimum 30-day notification. (emphasis added). We would think the ‘East Region’ contractor might object to CMS and giving ‘East Region’ work to their counterpart ‘West Region’ contractor and vice versa. SOW 3.5, paragraph 2 states, “If there are multiple providers at the same location, the Contractor shall provide one record for each provider with the appropriate provider ID and provider name attached to each record”. However, pricing is based on ‘site visits’ and appear to be location based. In this instance, multiple providers at one location appears to represent (1) site visit. We think offerors should seek clarification. We’re surprised at the level of cost and pricing data and associated documentation requested for the first two task orders, even though there’s adequate price competition and fixed pricing for presumably standardized services. Bidders with a large team of subcontractors should carefully manage the proposal to ensure the labor data correctly ties out among multiple proposal documents. We also think offerors (especially small businesses) should exercise care when pricing the sample task order to ensure they don’t unintentionally sign up for low indirect rates that they may not be able to adequately accommodate during the IDIQ contract. Pricing terminology is confusing! Everyone uses the language differently – with different philosophies on pricing, different terms for the stages of pricing and a lack of consistency for terms. All further complicated by which government agency you serve. This is normally done well in advance of the RFP dropping and can be critical to the bid/no-bid decision. It also serves as a guide for strategic planning and vision. Are you looking at opportunities that make sense for your company? Price to Win – this is a bottom-up build based on the draft RFP documents and final RFP documents. The end result is to model the Total Evaluated Price (TEP). The inputs into the TEP (for example, the technical solution), are determined during the Competitive Analysis. The outputs of the Price to Win analysis are to recommend specific strategies identified in competitors that can be incorporated into your internal pricing strategy. Price to Win should provide you with a comparison of labor categories, location, etc that are being priced by your competitors. You can use this information to compare to your own approach and make adjustments to your solution and to your pricing. Depending on available information, relationship with the agency and when the technical solution is developed, this should be done in advance of the final RFP hitting the street (in a perfect world). Proposal Pricing/Cost Volume/RFP Based – the actual cost volume, narrative and documentation for the audit file. This is the hard-core spreadsheet work, section B, documentation for the cost volume, and everything associated with the proposal as it relates to cost. Ideally, this is done with as much lead time as possible. In reality, it is always one of the last items to be complete as the pricer is waiting on subcontractor submissions, final verification of the staffing plan and any other shenanigans that come up in a color review. The goal is always to have it done in time for a thorough review. The key here is compliance, compliance, compliance. Follow the RFP to the T, focus on checking boxes and keep it simple. If you need any help with the above, please reach out to BOOST. We have SME’s who focus on each of the above areas and can support any phase of the pricing lifecycle.